Both Google Shopping campaigns as well as Google Adwords campaigns can be an excellent way of drawing traffic and generating conversions on your ecommerce website. Since I’m often asked about similarities and differences between the two, in this chapter we’ll be taking a look at the types of ads that dominate the arena in Google’s search result pages & more, as well as figure out which solution would work best for you. 1. What is Google AdWords and what does it offer compared to Google Shopping Ads? 2. How does Google AdWords work, compared to Google Shopping Ads? 3. Creative effort – how much work does Google AdWords need, compared to Google Shopping Ads? 4. Ad Placement – where do Google AdWords campaigns show up, compared to Google Shopping Ads? 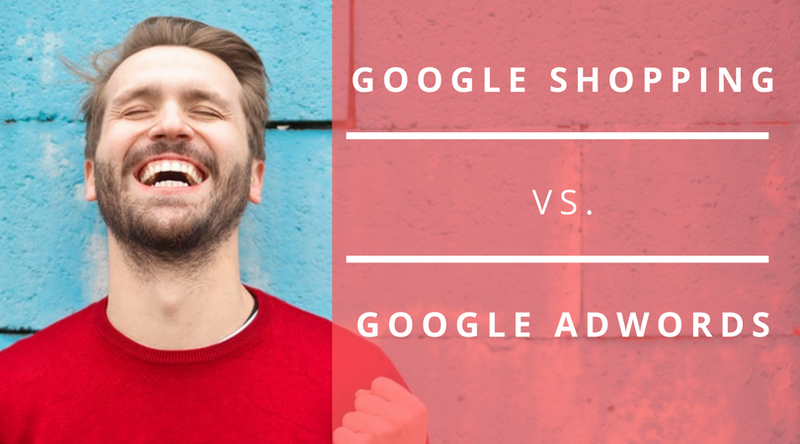 7. Who is Google Adwords best for, compared to Google Shopping Ads? Since Google AdWords encourages advertisers to set up campaigns that target both the Search and Display networks, we’ll be outlining the components of each of these networks and examining how and what types of advertisers should be using them. Text ads are probably the most common, well-known form of PPC advertising. They’re what most people think of when they imagine what Google AdWords might look like: ads that show up as lines of text when you search in Google.com. Launch paid advertising campaigns that convert. Get a free PPC evaluation from one of our senior marketing consultants!  Get in touch now! These ads show up on the Search Network, which gives advertisers the opportunity to show ads at the precise time when prospects are searching for their products or services. Since the users have actually taken an action by searching for a solution to their problem, they are closer to the bottom of your marketing funnel, making them one of most likely to convert to a lead or customer. Unlike Google Shopping campaigns or text ads, Display ads have nothing to do with searching on Google.com. Instead, these are the visual ads that are displayed on other websites across the internet. Websites like blogs, news sites, magazines that are all part of the Google Display Network, which has over 2 million sites that have Google AdSense enabled and reaches over 90% of people on the Internet. The key difference between Google Shopping campaigns and Display ads is that when you target the Display Network, you’re not targeting users that are searching for your products. Instead, you’re targeting people as they visit another website, with ads that show up based on different targeting parameters such as user demographics or interests. How much information do Google Adwords campaigns require, compared to Google Shopping Ads? Text ads mimic organic results and, like Google Shopping, are displayed in the Google Search Results pages. They can also be featured on Search partner websites, but we’ll dive into more on that later. Just like Google Shopping campaigns, text ads are targeted based on keywords users select as their search query. Unlike Google Shopping, you have more control over what search terms your ads show up for because you can specify the keywords, instead of having Google do it for you. The standard format includes 3 parts: a headline text, a display URL and a description. You can find more information on format, including character length limits on the Google Support page. While Google Shopping and text ads are more traditional search advertising, Display ads mean reaching beyond the search results page and placing your visual, image based ads across the internet, on a variety of websites. Since the Google Display Network is so expansive, there’s a lot of room to attract the user’s attention and entice them into clicking through to your website with expressive, visual based content. You can also create Responsive Ads using the the Display Ad builder tool from within Adwords. These adapt to fit across available ad spaces on websites across the internet. Unlike Google Shopping, which takes its text from product titles and descriptions, on Google AdWords you can personalize the text of the ad by writing a custom message. Not only are text ads more detailed, but they allow advertisers to include extensions with additional links, phone numbers and addresses, which can prove useful for certain types of products where more information is required. Request a complimentary strategy call and we’ll start working on your PPC goals as early as today! You can also choose the landing page to send the user to – a custom landing page, or a category or set of products, as opposed to an individual product page, which is the case for Google Shopping Campaigns. While this does give you a higher degree of control over the user’s experience with your ad, it does require a higher creative effort than Google Shopping campaigns. Visually speaking, Google Shopping ads are pretty straightforward – a product photo. But Google AdWords Display ads can be multiple ad formats, like static, animated or dynamic banners or even video ads displayed on YouTube. The ad format itself varies and can be different sizes, from the IAB (Internet Advertising Bureau) standard sizes, which have lost popularity in recent years, to responsive ads which are better integrated in various website content. Consistently designing top-notch ad creative that engages users can prove to be challenging, which is why display ads require the most creative effort of all of Google’s ad typologies. A standard text ad can appear above and below organic Google search results. Within the Search Network, you can choose between having your ads displayed on Google search as well as Search partners such as AOL.com or Ask.com. Another advantage with text ads is that you get to see the position or rank of the ad, where the ad showed up. With Google Shopping, that data is not available yet because the ads are displayed in a different format. While shopping and text ads feature in the Search Network in standard fixed positions, Display ads are featured on other websites like blogs, news sites, magazines that are part of the Google Display Network, so positioning can vary according to format and available content space. The main targeting option for text ads is using keywords. By building a list of keywords that are relevant to your business, you’ll be able to display your ads whenever a prospective customer searches for that particular keyword. Unlike Google Shopping, where the system automatically draws your keywords from product titles and descriptions, in Google AdWords you have to build, set up, and update your own list. I also recommend setting up a list of Negative keywords on the search network, in order to avoid your ads being triggered by search phrases that have nothing to do with your products. The features are slightly different for Display ads. The first step is choosing how you want to target your user. One option is contextual targeting, which relies on Google to match your keywords and ads to relevant web pages across its network. It’s the most basic targeting option available for Display ads and, just like Google Shopping, leaves much of the work up to Google itself. The next tier is behavioral targeting, which is a method of targeting users based on their internet browsing history. Once Google learns what topics a user might be interested in, it will place them in an audience group which advertisers can then target as being a good fit for their products. The final option is demographic targeting. It’s one of the most important ones especially for fashion retailers. You can select between males, females and different age ranges to target your ideal customers. Google Shopping campaigns and Display ads also have another aspect in common – their ability to use a product feed in targeting. Shopping ads require it to run the campaign, while Display ads use a feed when running Dynamic Remarketing ads. On Google AdWords, Dynamic Display Remarketing works with a tracking code that tells Google what product a user saw, what types of actions the user performed on the website (add to cart, purchase or lack of) and can dynamically load the product photos and titles into banners. Both text ads, as well as display ones are tracked directly in AdWords, with information such as the number of times your ads have served and the number of clicks on your ads readily available. There are, however, some conversion discrepancies between Google Analytics and Google AdWords that you should keep in mind. AdWords attributes the conversion date as being the actual click date. Which means that even if a user clicks on one of your ads today but actually purchases your product the next day, Analytics will show the latter, while AdWords will show the first day as the time of conversion. When you first start creating a new AdWords campaign, Google encourages you to target both the Search network, as well as the Display network, as this should be the “Best opportunity to reach the most customers”. But just because targeting both networks will give you more reach, that doesn’t mean it’s a good idea. Using the exact same strategy for both can actually prove to be detrimental to your account since, as we’ve seen, they target and engage users in different ways. Text ads are most useful when the terms you’re trying to match with your keywords are not product specific – meaning that they don’t relate to an individual brand or product and can instead match to a multitude of results. Like vacuum cleaners, which is a good search term that can display both text ads, as well as shopping ads. In theory, Google Shopping campaigns should have a better average Click-Through-Rate, since, as opposed to text ads, they use both a picture and price as visual aids to engage users. At the same time, we’ve seen better Conversion Rates and ROI on shopping campaigns, but a higher bounce rate, since the landing page is the product page itself and the client either likes it or not. Text ads are a great way of expanding your Google Shopping campaigns, which can boost visibility and lead to more conversions. Let’s say you have your top products featured in Google Shopping, available for customers to click on and be directed to the product page. Using a text ad, you can also have your category landing page, on the same search results page, where people can start browsing through your entire array of products. Or if you have a profitable keyword in your shopping ads, you can increase exposure for that keyword by also building a text ad that targets it. Using text ads in conjunction with shopping ads are a great way of being featured more than once on the search results page. Whereas with normal text ads you can only show up one per query, bidding on shopping ads at the same time allows you to show up twice on the page. Running a Display Network campaign is a great way of familiarizing people with your brand and generating awareness for your product. Since AdWords provides a variety of targeting options, you’re able to appear on websites that are popular amongst your desired target audience and reach your potential clients at the top of the sales funnel, generating more interest in the product. If you’ve already invested time and money into a graphics department, you should take advantage of the great content at your disposal by putting it to good use on YouTube or the Display Network itself. A visual, image or video-based campaign can be a powerful way of connecting with your audience. In short, you should be using Google AdWords because you want to tap into the huge numbers of people who search for information and products online. Plus, it’s a great way of putting yourself and your products out there for people that are actually looking for them. Text ads are generally good for fulfilling demand, while Display ads are best used in generating it. The truth is that for Search, Display and Shopping campaigns, the level of complexity is entirely up to you. Each campaign type lets you set specific targeting. Setting up these details will make your ad campaign more successful, but it also takes more time and know-how. The platform is, after all, designed with advertising professionals in mind. If you’re new to Google AdWords, don’t feel like you need to take it very far from the very start. Start simple and experiment until you grow more comfortable with creating campaigns. Keep an eye on your analytics tools, regularly update your strategies and don’t be worried about asking for help from a professional SEM agency. Got any questions? Contact us today & let us improve your paid shopping campaigns!